The papaya fruit comes from what looks like a tree, but it is actually a very large herb. The plant grows to a height of 6-9 m (20-30 ft) and is a fast-growing plant with a short life span. There are two main varieties of papaya fruit, the Hawaiian and Mexican papayas. The Hawaiian variety is pear-shaped, weighs about 500 g (1 lb), and has a yellow skin when ripe. The Mexican variety can weigh up to 5 kg (10 lbs), be more then 30 cm (1 ft) long, and has a yellow, orange, or pink flesh when ripe. The fruit and leaves of the papaya contain a protease enzyme called papain which aids in digestion and can be used to tenderize meat since it works by breaking down protein. 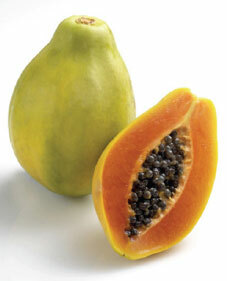 The papaya fruit also has many edible seeds in the center which taste similar to black pepper. Papaya can be eaten raw, cooked in meals (usually curries, salads, and stews), made into jellies, and drank as a juice. Some people use the seeds as a substitute for black pepper and cook and eat the leaves like spinach. The stem and bark of the papaya plant are used in rope production and the leaves as a soap substitute to remove stains. Papaya is also a rich source of latex which is dried and marketed as a meat tenderizer, used for medicinal purposes, can be an adjunct in rubber manufacturing, may be found in chewing gum, and can be used to treat wool and silk prior to dyeing. People that have a latex allergy should be cautious when handling green, unripe papaya since it is high in latex. Beyond all these already great qualities of papaya it is also a nutrient dense food giving us the energy and nutrients needed to maintain an active lifestyle. The papaya is rich in vitamin A and C (which gives the fruit the magnificent yellow color), as well as vitamins B1, B2, niacin, folate, B6, E, and K. Papaya are also a good source of potassium, phosphorus, magnesium, calcium, sodium, iron, selenium, zinc, manganese, and copper. This is definitely a powerful fruit to replenish your body after a nice long run through the Amazon rainforest.